윤봉길은 충청남도 예산군 덕산면 사량리에서 태어나, 덕산보통학교와 오치서숙에서 공부하였고 19세 때 고향에 야학을 세워 농촌계몽운동을 시작했다. 20세 때 각곡독서회를 조직하고 『농민독본』을 편찬했으며, 22세 때 월진회를 조직, 농촌운동을 정열적으로 전개하였다. 윤봉길의사는 국내에서 독립운동이 어려워지자 23세때 중국으로 망명하여 1931년 김구선생의 한인애국단에 가입하였다. 그 뒤 항일 투쟁을 계속하다가 1932년 4월 29일 혼자 일본의 상해사변 전승축하회가 열리던 상해의 홍구공원에 폭탄을 던져 일본군총사령관 시라가와 등 일본의 군수뇌부를 제거하는데 성공하였다. 그 자리에서 체포된 윤봉길 의사는 군법재판 단심에서 사형을 선고받고 11월 일본으로 이송되어 1932년 12월 19일 일본 대판 위수형무소에서 24살의 나이로 세상을 떠났다. 1. 선서문(尹奉吉義士 遺品-宣誓文)은 1932년 4월 29일 상해 홍구공원에서 폭탄을 투척하는 의거를 일으킨 독립운동가 윤봉길(1908∼1932)의사가 남긴 유품들 가운데 하나로 김구선생의 한인애국단에 입단하는 것을 직접 손으로 쓴 선서문이다. 이 글의 크기는 가로 21.5㎝, 세로 27㎝이다. 2. 윤봉길의사 이력서 및 유서(尹奉吉義士 遺品 - 尹奉吉義士 履歷書 및 遺書)는1932년 4월 29일 상해 홍구공원에서 폭탄을 투척하는 의거를 일으킨 독립운동가 윤봉길(1908∼1932)의사가 남긴 유품들 가운데 하나로 1931년 한인애국단에 입단할 때 손으로 직접 쓴 이력서와 유서이다. 유서는 펜글씨로 씌여있고, 크기는 가로 16.5㎝, 세로 29㎝이며, 1책 17매이다. 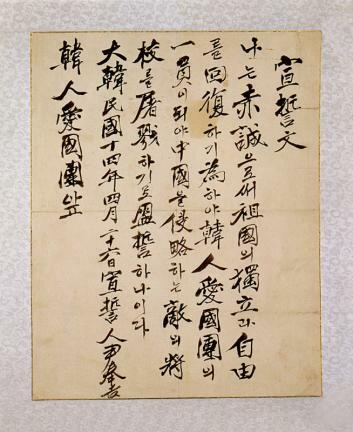 This pledge of commitment is one of the surviving personal documents of Yun Bong-gil, the author of the Shanghai bombing at Hongkou Park (today’s Luxun Park) in Shanghai against the leadership of the Japanese Imperial Army (April 29, 1932). 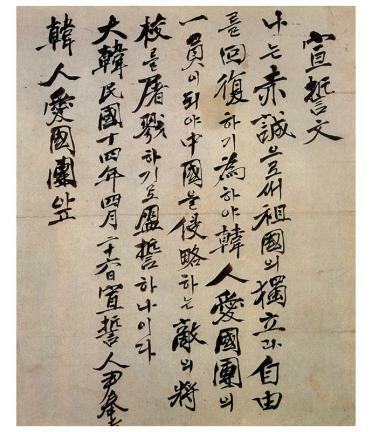 This hand-written pledge was drafted by him at the time of joining Haninaegukdan, the Korean independence activist organization run by Kim Gu. Born at Saryang-ri, Yesan-gun, Chungcheongnam-do, Yun Bong-gil attended Deoksan Elementary School and later Ochi seosuk. When he was nineteen years of age, he set up a night school in his hometown to educate its rural residents. 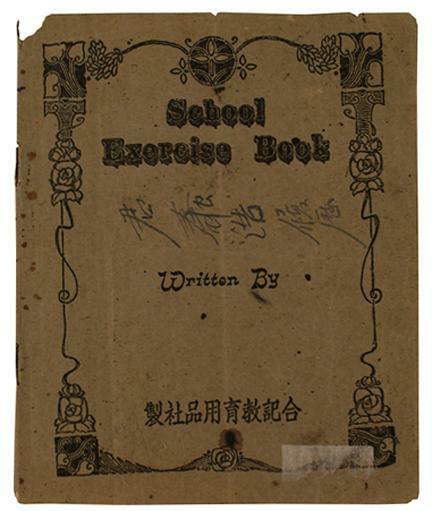 During the following year, the twenty year-old Yun Bong-gil created a book club (‘Gakgokdokseohoe’) and authored Nongmin dokbon, an instructional book for educating the peasantry. At the age of twenty-two, he started a rural community movement and founded Woljinhoe as its headquarters. When he was twenty-three years of age, as the oppression of independence activists grew severer, Yun Bong-gil left Korea for China. In 1931, he joined Haninaegukdan, an organization led by Kim Gu. On April 29, 1932, he threw a bomb at Japanese army officials holding an event celebrating Japan’s war victories at Hongkou Park in Shanghai, killing or wounding several members of the army leadership, including the supreme commander Yoshinori Shirakawa. Yun Bong-gil was arrested at the scene. He was court martialed and received a death sentence. After his trial and sentencing, Yun Bong-gil was transferred to Japan in November of the same year and was executed on December 19, 1932 in an Osaka prison.